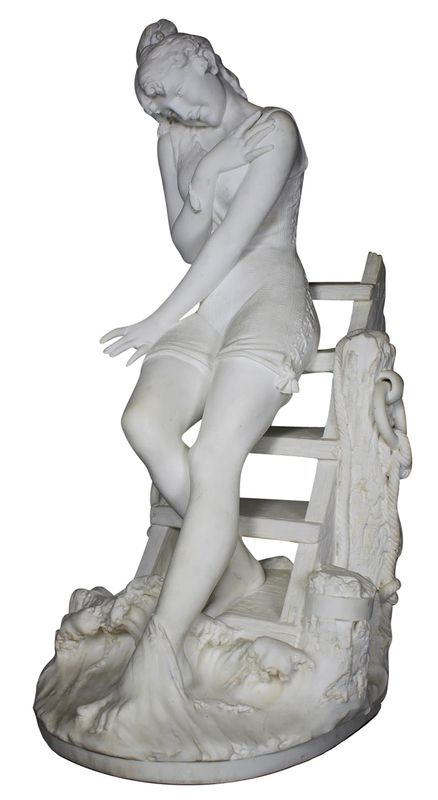 An Extraordinary Fine Italian 19th Century Carrara Marble Sculpture of a Young Beauty Going for a Swim Standing on the Steps of a Dock, raised on a carved green marble pedestal, by Emilio Fiaschi (Italian, 1858-1941). 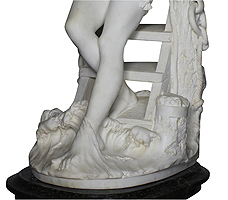 The intricately carved marble figure of the young beauty wearing a laced bathing suit, stepping down from old and damaged dock to test the temperature of the water with her toes embodies a moment in time in the late 19th century when women began wearing more revealing and elegant swimwear. Fiaschi's artful and sensual depiction of the girl's charming pose and delightful smile as she anticipates the joy of going for a swim makes this one of his finest works. Signed: E. Fiaschi. 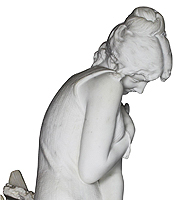 Circa: Florence, 1890.